Nearly a decade later, Will Ferrell is back as Ron Burgundy, everyone’s favorite retro newscaster. 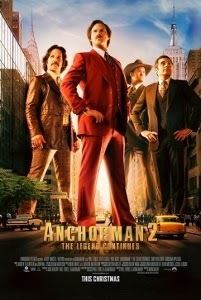 Anchorman 2: The Legend Continues arrives with a pre-sold, built-in audience, which has grown exponentially over the years as the film amassed a loyal fan base via home video and cable screenings. 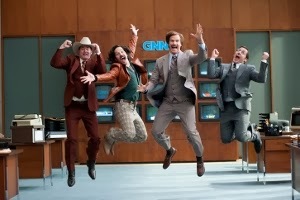 The thing is, the first Anchorman was a highly uneven comedy to begin with. Intermittently funny, largely because the ‘70s era of broadcast news was so ripe for parody, the film played like an interminable SNL sketch. 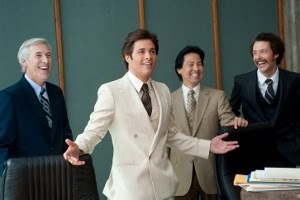 The same can be said of part two, which reunites Ron with the core group of Brick Tamland (Steve Carell), Brian Fantana (Paul Rudd), and Champ Kind (David Koechner). The year is 1980. After his newswoman wife Veronica (Christina Applegate) is promoted to prime time, a dejected and jobless Ron winds up hosting a dolphin show at SeaWorld. His re-entry into the news world comes with the announcement of what will be the first-ever 24-hour news network, GNN. Ron is recruited to anchor the graveyard shift and he’s quick to reunite the old gang. Some of the funniest bits involve the whereabouts of Brick, Brian, and Champ and how they’ve been keeping busy since the first film (Brick’s “fate” is possibly the film’s most inspired gag). Some politically-incorrect fun is had when Ron and the gang first meet their new boss, who happens to be a black woman, Linda (Meagan Good). The big man at GNN is ultra-suave, uber-handsome Jack Lime (James Marsden) and Ron is immediately ready to duke it out. Jack’s a prime time guy, but Ron bets him that his crew can defeat him in the ratings despite their inopportune time slot. In a frantic rush to figure out how to win viewers at two in the morning, Ron and company inadvertently invent the whole concept of exploitative junk news – the kind we see padding out the content of all the current cable news networks. Suddenly cute animal stories and high-speed car chases dominate Ron’s show, leaving old schoolers like Jack (and, on a competing network, Ron’s wife Veronica) gasping for air. Nothing more needs to be said, except that viewers can expect a feast of fun cameo appearances (by some very big names, try to avoid looking at a cast list – they’re better as surprises). To explain any of the gags would ruin them. The biggest problem with Anchorman 2 is its two hour running time. The zaniness began to wear me down over time. There’s no shortage of laughs, it’s just that their effectiveness diminishes significantly over time – particularly during the second half. Even the climatic cameos begin to seem like overkill. With no one really given any great lines, the very appearance of well-known celebs becomes the joke in and of itself (and a rather lazy one). While Kristen Wiig is wasted in a thankless, throwaway role as Brick’s eccentric love interest, special note must be made of the surprise scene-stealer: Judah Nelson as Ron and Veronica’s son, Walter. Nelson at first seems like a very poor child actor, but then you realize he’s doing a brilliant job of parodying bad child actors. His line readings are the most consistently hilarious aspect of the movie, especially when he bids farewell to the Burgundy’s pet shark (don’t ask! ).